Molly I., a sophomore high school student from Baltimore, MD, attended the Capitals-Islanders game Friday with three of her hockey-loving friends: Sydney, Catherine, and Morgan. They all brought signs for warmups. Encouraged, they decided to step up their sign game and all hold up something clever along the glass. I love you Tom Wilson, my boyfriend says it’s ok read one. 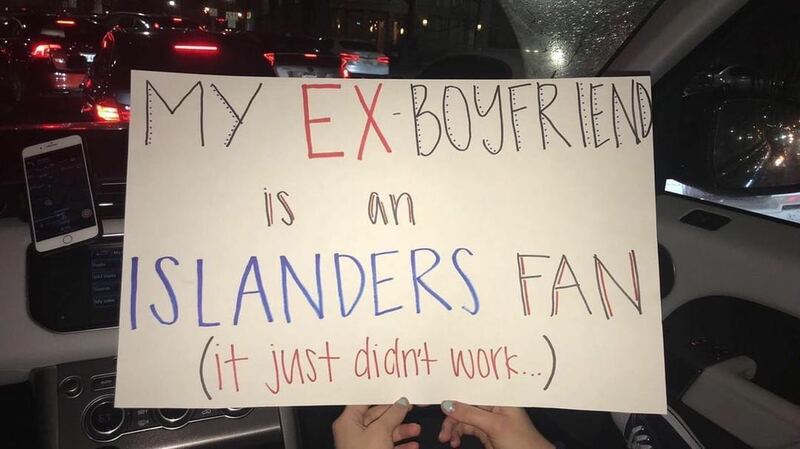 My ex-boyfriend was an Islanders fan, it just didn’t work out read another. Before I turn 18 I want to see the Caps win the Stanley cup, see the banner raised, and get a puck read a third. But it was Molly’s sign that got the attention of Jakub Vrana. Molly used her poster to ask the 22-year-old, third-year forward to prom. The sign said Hey #13 – Prom? If not, cant I have a puck?. During warmups, the girls held up their signs and documented the reactions of the players. They caught Vrana subtly look over. Finally towards the end of warmups, Vrana came over and tossed a puck to Molly. The Caps fan jumped up and down and let out a huge smile. I asked Molly if she had something she’d want to tell Vrana if he read this hockey blog.